With this newly created API key you can modify it by working with an SQL development environment and change the key. Here is a link to some SQL instructions if you are looking for other options to modify tables or data. SQLite functions very similarly and you can access the prompts via your terminal session. 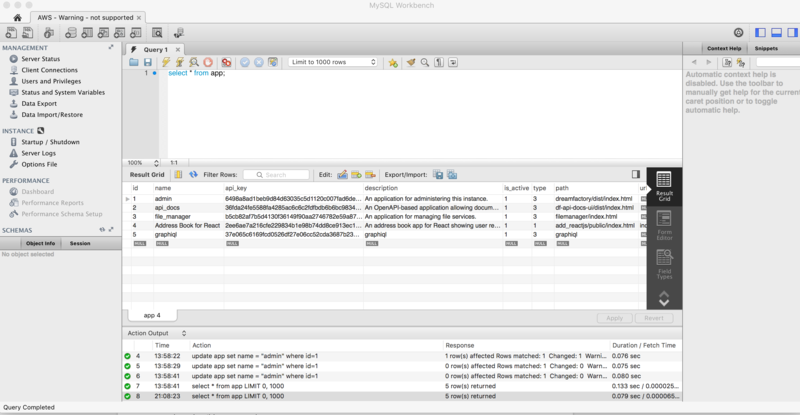 The issue there is that it doesn’t look as “pretty” as the MySQL dev tools, but the data is organized in the same way. This will get you into the sqlite prompt so that you can access your database. You can now grab access to the apps and their details. Like I said a little messy looking, but the columns are the same as if you were in MySQL. Use the same set of commands as you would in the above SQL example to update any of the records you need to. You can access all of the CLI commands you need for SQLite here. And you are now off and running again. Remember, if you need any help at all, please reach out to us at [email protected].